As a patron you can pledge whatever amount you want each month and in return I will horrify you with scarily delicious content only available to see here. You are essentially subscribing to my very own behind the scenes horror club! You can cancel a pledge at any time and if you don't want to pledge you can follow my public posts here too and can get involved in the comments! Your pledge means so much to me and it also means I can keep creating new monsters and characters. Your pledge from $2 will give you exclusive access to my Patreon only feed which will include sketches, works in progress, experiments, first chance to buy originals and more. $5 and up gives you access to videos and delicious goodies! 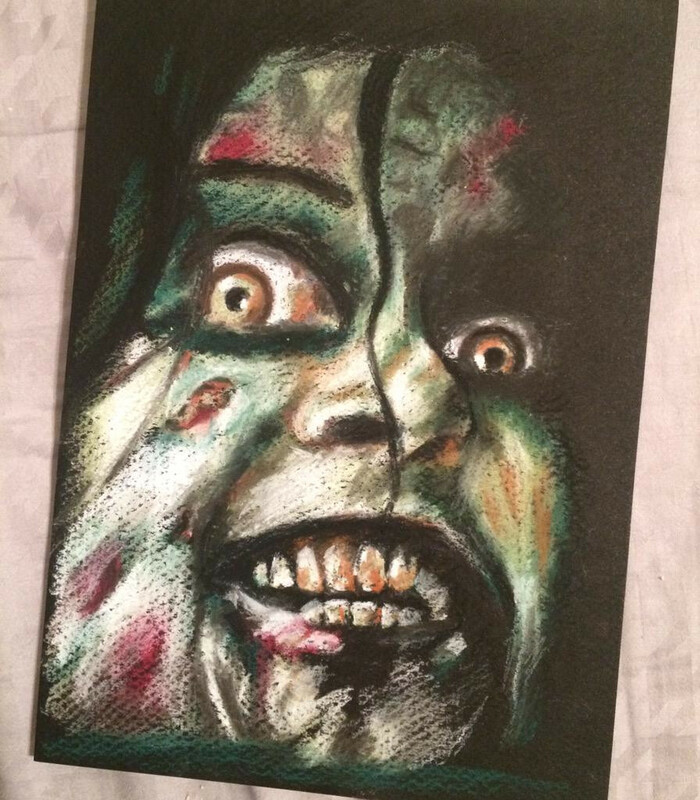 All the videos I create are for art lovers, horror lovers and aspiring artists! I will be showing you in each video the stages that my portraits go through on their way to becoming a finished artwork. You can watch me work with soft pastels and pastel pencils on various kinds of paper. Speed drawings of my work from start to finish. If you are a little unsure about how Patreon works, this video is brilliant at explaining how it all works. These badges and A5 prints are available to all who pledge at the $10 tier on the first month of your pledge. OTHER WAYS TO SUPPORT MY ART! Chop you up for a ghoulish stew!" Thank you!! Your support means the world to me! 🎁 PRIVATE ACCESS Access to my private patreon feed which includes behind the scenes photos and finished artwork. 👀 NEWSLETTER Signed up to my wicked newsletter which lets you know about up coming projects and subscriber only sales. 🗣 MILESTONE REWARD These are extra horror rewards for those who have been patrons for a long time. You unlock a Milestone reward when you reach $350 and $1000. 🎁 Access to rewards from previous level tiers PLUS! 🧛🏻‍♀️ Mini A5 signed print (on your first pledge) at this level! 🤡 A tasty A5 original pastel sketch. Every month you pledge this amount you will receive a new original! 🎈 On your first pledge at this level you will also receive a signed A5 print and horror badge. Let's make more horror! UNLOCK SOMETHING HORRIFIC. Every single one of you will receive something from me in the post. I've not decided what that will be yet, but if you have any ideas, don't hesitate to let me know!